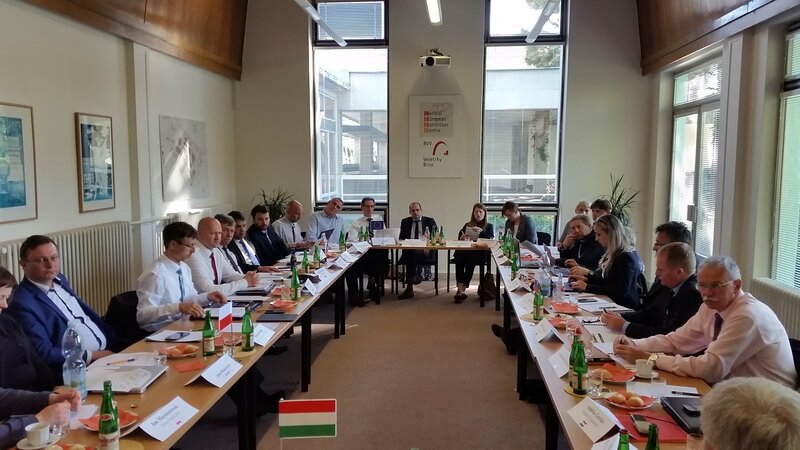 Farm Europe was delighted to take part and to contribute to the reflection of the 65th Meeting of the Representatives of Chambers of Agriculture of the Visegrad 4+ group (Czech Republic, Hungary, Poland, Slovakia, Slovenia, and Croatia). These organisations adopted a first set of common position on the most pressing topics for the future of the Common Agriculture Policy, designing key orientations to enhance both the economic and the environmental sustainability of the European farming sector. “Today marks the beginning of a very timely and necessary work. As a former negotiator of the CAP, I definitely know how challenging it is. I truly believe that the dialogue you established, as the Visegrad Group, is of paramount importance to build a strong clear and promising future for a truly Common Agricultural Policy. To work ahead of the EU agenda, to be proactive and not reactive. To propose needed and feasible evolutions of EU policies and to pursue the necessary path towards a better future for the agricultural sectors all across the EU. This overall ambitious strategy can only be built by working together for a shared, common project. With the current level of political uncertainty in most of EU Member states, not to mention the Brexit, it is of utmost importance for economic actors and their representative bodies, to be conscious and to realise what they want for the future, to define a strategy and even more to table concrete proposals. This is exactly our ambition at Farm Europe, and thank you to AKCR for the truly appreciated invitation to be here with you today. Thank you for being such an involved and a valuable active partner as well. A priority is to have Central and Eastern Member states in the driving seat of the future CAP. As correctly underlined by the Bratislava Declaration you signed last month, the strategy to be promoted should be based on three main pillars Investments, Sustainability and Resilience. Today, the challenge is not only to be in a position to articulate this vision, the related strategy and architecture of a renewed, more effective CAP before the start of negotiations on the next financial perspectives, thus before 2018. But as well to identify and select the right tools, which are needed to make this strategy work smoothly. Investments: this is the challenge of the EU precision & smart farming sector, but in considering a short term vision and not a 20 years time frame. An array of competitive investments should be defined by each sector, considering both the economic and environmental benefits they can bring to the society. Sustainability: building on this evolution path, switching from a prescriptive CAP to a results-based CAP, by defining what is expected from farmers and giving them freedom of action to deliver the expected, well defined and easily measurable goals. Resilience: direct payments remain the first vital layer. Payments that are legitimate, needed and fair. In that respect, the economic dimension should be put ahead when it comes to EU tools. Key is to build on this first layer, by devising efficient tools to manage climate and markets volatility and to increase the potential of farming sector in the context of a food chain, whose relations are today very unbalanced. These points have been partially addressed by the on-going negotiations on the Financial Omnibus, thanks to the right, productive approach of the European Parliament strongly supported by Farm Europe. As a whole, in one word, the key aim today is to switch from a EU policy approach, which focuses only on conservation, to policies, which are conceived and able to promote entrepreneurial approaches, where farmers are at the core of the whole process, and notably the CAP, where sustainability has to be improved, thanks to better competitiveness and increased farm profitability. The CAP should be what it was supposed to be since the beginning: a EU policy promoting investments. Investments of the EU in its economy, growth and jobs, investments of the EU in sustainability, and investments in its farming sector which is the only one able to achieve growth and provide jobs in rural areas and capable at the same time to fight against climate change effectively. This will happen only if the next CAP is reshaped on a solid basis. Its focus should be on the concept of double performance, economic and environmental, considering farmers as entrepreneurs while not forgetting the social and territorial dimension of agriculture. It is our common responsibility to draw the renewed CAP we need, to propose the forward-looking vision and to table concrete tools to deliver in practice. And, of course, to convince and inspire decision-makers to act in this regard. Indeed, we have to act now. 2018 is tomorrow and the Council wants to define the main orientations of the next CAP, whenever this CAP will be reformed and implemented (2020 or 2022).